A kheer recipe is one of the many indian sweet recipes given. Kheer is a popular Indian sweet. It is also called as - payash, payasa, payasam' in Indian languages. Kheer is simple and easy to make. Most of the kheers are milk based but for some of the south Indian payasam recipes, milk is not necessary. Of course you may add it if you like. You can also use coconut milk instead of dairy milk. Kheer is healthy Indian sweet as no deep frying is generally involved. 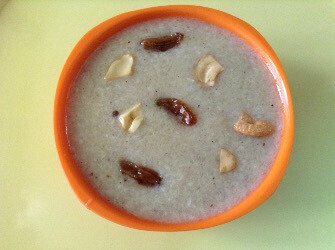 Kheer or payasam generally has a consistency of porridge. But it can be made as thick or thin as you like. Poppy seeds kheer (Ghasgase payasa) is generally made very thin. You can keep it plain or make it as rich as you like with the addition of nuts like pistachio, almonds etc. Using grains such as Rice Kheer , whole wheat, dalia (broken wheat) kheer. Vegetables such as carrots, bottle gourd (doodhi) etc. Semiya - Vermicelli kheer and Sago kheer, rava (semolina-cream of wheat) kheer . KhusKhus kheer - Ghasghase Payasa - Poppy seeds Kheer poppy seeds and apples , dry fruits etc. 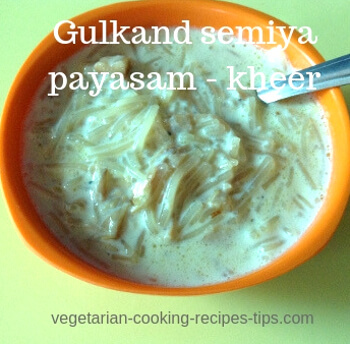 Most commonly made kheer is rice kheer or the vermicelli kheer which is called sevai or semiya payasam. Rice kheer is my favorite. 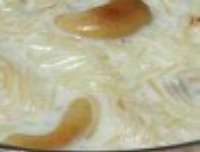 Vermicelli kheer is very quick to make and tastes great too. A commonly used flavor for kheer is cardamom but You can add your favorite essence , rose or almond or vanilla essence if you wish. Sugar or Jaggery(brown sugar) is added as a sweetener to kheer depending on the main ingredient and the personal choice.